As if great feats of alchemy weren’t already required where the matter of home ownership is concerned, fashion’s foremost alchemist Alessandro Michele has thrown another spanner into the works in the shape of Gucci’s Décor Collection, the maximal antidote to hygge, launching September. As is his wont by now, Michele’s edict is not that you overhaul your domestic interiors completely, but consider using his cerebral decorative details to customise your living space as you see fit in a fashion not dissimilar from his haute DIY ready-to-wear offering. Naturally, Gucci Décor draws heavily on the baroque design motifs with which Michele has made his indelible mark on fashion; those signatures, many drawn from the lexicon of the Gucci Garden, are reimagined in the shape of furniture, furnishings and an array of crockery enlivened with liberal applications of flora, fauna and finery. All of which isn’t to say that the option of going the full Gucci isn’t available to ardant Michele acolytes, of which there are plenty. The Décor collection also includes wallpapers in silk, vinyl and paper, for those looking to dress their home entirely in Gucci’s new wave romanticism – from the window to the wall. Below, take a closer look at key pieces from the inaugural Gucci Décor collection. Eight cushion designs, each in varying shapes and thickness, will foreseeably be to the Décor collection what variations on the Princetown has been to the wardrobes of legion Michele fans. Some are tasselled, some merely trimmed; all, however, come with contrasting front sides in plush velvet embroidered with the occupants of the Michele menagerie: bees, leopards, cats, snakes and tigers. The reverse sides sport brightly-coloured capitonné and jacquards. Function meets finery in a selection of circular metal trays that sound as though they’ll sit at the more affordable end of the spectrum. As some of the smaller Décor options, alongside the collection of porcelain pieces produced by the heritage Gucci-owned Florentine manufacturer Richard Ginori, they’re perfectly suited for either utilitarian or decorative purposes. In collaboration with the Ginori porcelain factory, founded in 1735, Michele has designed a range of crockery, candle and incense holders sure to give your pristine selection of Helmut Newton coffee table books are run for their money in the credenza real estate stakes. Imagine how great they’ll look next to your dog-eared copy of Grace: A Memoir. 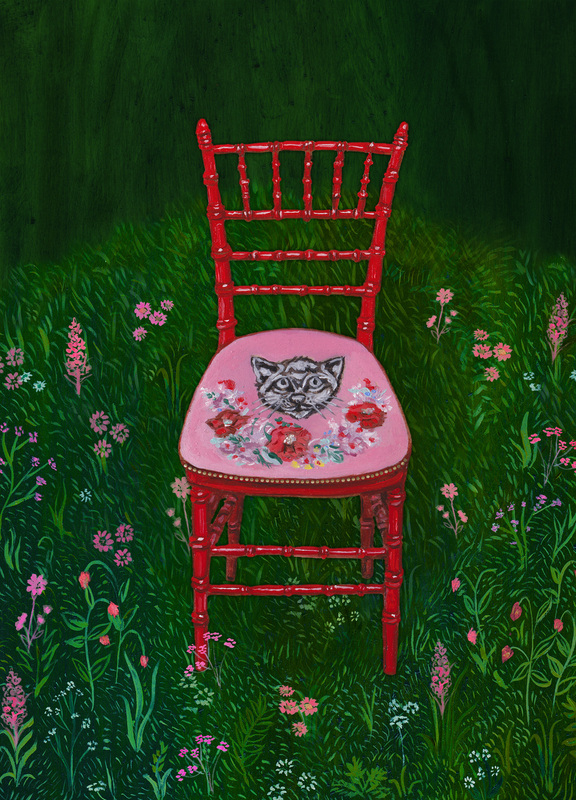 How better to hold court at dinner than by lining your table with half a dozen high-backed, vividly lacquered and beautifully upholstered dining chairs displaying house motifs like the ceramic Staffordshire dog, the roaring tiger, a moth, bee or a cat? A vanity seat upholstered in bright floral jacquard with silver details will also be available, though it is not pictured here. A folding metal side-table, which also boasts a highly-decorative surface, epitomises Michele’s notion that any environment can be easily dressed and redressed to suit your needs. Once the province of the demure and those seeking to hide, decorative folding screens now command your full attention. Both sides are patterned with varying designs, including a garden print, a pineapple print, geometrics, and patterns featuring octopuses or leaves, all designs originally seen in Gucci’s ready-to-wear collections. Another screen faced with pink velvet capitonné – think the diamond patterned upholstery of a Chesterfield sofa – invokes the décor of Gucci’s store interiors and window displays. In time for spring cleaning, the Décor Collection will become available from September in Gucci flagship stores, online and at selected specialty stores. In keeping with the notion that these are pieces to blend seamlessly with your life and wardrobe, there will be no dedicated area to display the collection; instead, it will be diffused throughout Gucci store interiors – another welcome addition to Michele’s ever expanding universe.